MAGWELL suspended Electro and Permanent magnetic are designed to remove both large and small types of tramp metal from product streams conveyed by belts. The tramp metal that is captured by the magnet accumulates across the entire magnetic face, substantially increasing the amount of tramp iron the magnet can retain before cleaning is required. 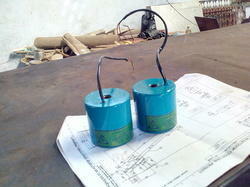 Usually, the removal of the tramp metal can be obtained for a lower cost than an electromagnet. The magnetic pole, the steel cross-section and the flow through the coil have all been precisely tailored to each other to provide optimumtransport power and weight conditions. 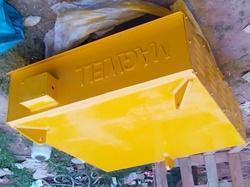 MAGWELL Batch V type powder blenders are of wide application and highly efficient. They are used in leading processing plants for mixing materials such as chemicals, foods, drugs, medicines, cosmetics, plastics, synthetics, dyes, fertilizers, insecticides, animal feeds, and many other products. 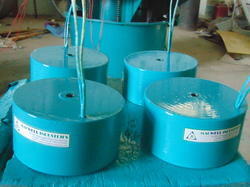 Horizontal, single shaft with double proportioned ribbon is housed in the tubular mixing drum. The vortex ribbon rotates with main shaft and thus bring raw material move towards direction of vortex ribbon. We can design round or rectangular shape inlet port on top cover, discharge valve (manual, pneumatic or electric driven) in middle of bottom. 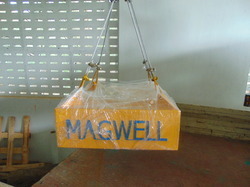 MAGWELL Ribbon Blender which is ideal for light to medium mixing.